They say that success is the sum of small efforts repeated day in and day out. This statement certainly applies to the success of Jungle Stix–simple bamboo marshmallow roasting sticks. 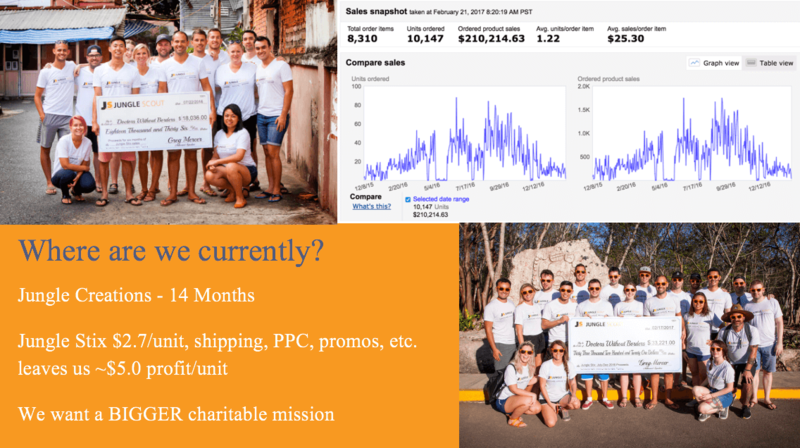 Who would have thought in December 2015 when we launched the product on Amazon as the product in the Collaborative Launch that the product would sell nearly $200k in just the first year? Greg Mercer did (though I think even he was pleasantly surprised by the volume of sales). But if there is one person who would try to outperform an already impressive accomplishment, it’s Greg. And of course he runs with a bit of swagger: one million dollars, to be precise! Today Greg launched his Million Dollar Case Study: a step-by-step study in generating a million dollars in selling physical products. We will share every detail, financial figure, and strategy on our path to hitting seven figures. This makes for a medley of excitement, inspiration, and education. 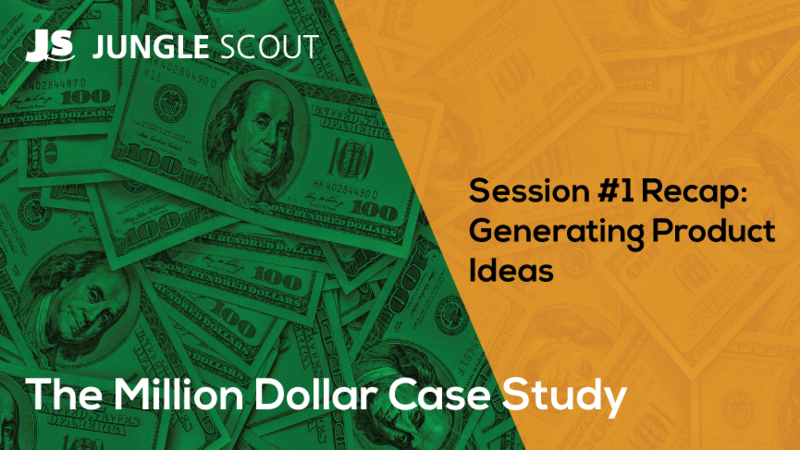 So let’s get to it and review the first session of The Million Dollar Case Study! The easiest way to get to a million dollars is to layer on more products. Hence the search beginning now, for a new product that will take us to seven figures. But we can go bigger! And that is the genesis of this million dollar case study! 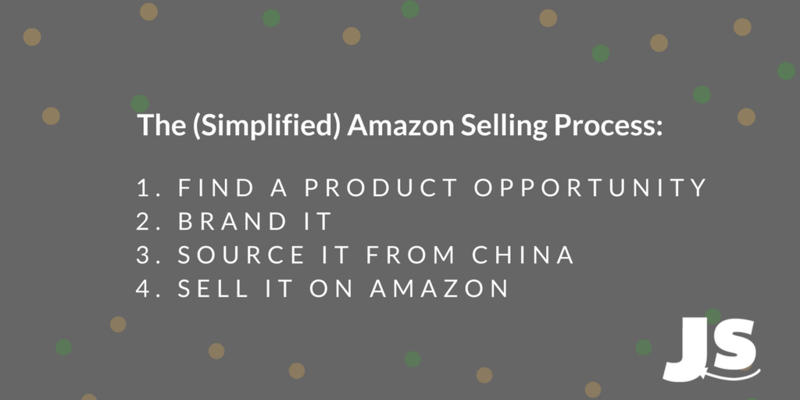 The general knowledge required, not to mention the intricacies of selling on Amazon, are enough to question your decisions before you even start finding a product. But that is not a reason to not sell on Amazon! Enter the concept of “Just In Time Learning.” In short, don’t worry about the looming details down the road, but just follow along with us along each step of the process, and learn the necessities as we cover it in the case study. Trust us, if you have the drive, all you need to do is follow along, do your home work, and you will be well on your way. There is a certain level of faith in numbers that you need when doing product research. Though it may seem like a more fun and attractive option to sell a product that aligns with your passion, it is not always prudent. The best way to identify a product idea is to begin with a blank slate, and let existing customer demand guide your brainstorming process. Trust the process, as they say. Another instinct we have to dispel is that we are not looking to sell new product ideas or invent new products. Success as an Amazon seller will come when you can identify what people are searching for on Amazon today. If you can capture just a sliver of this existing demand with a solid product (hence you get good reviews and move up in the organic rankings), and a strong product listing (sharp product photos, thorough product descriptions with well-researched keywords) then you are setting yourself up for success. And that’s exactly what we want! Pay close attention to these criteria – as it will stop you from making a bad decision later down the line (read: an expensive mistake). Low Seasonality – We want a product that will sell year round. No Legal Issues – Products that have licenses or trademark issues are to be avoided. Price Point greater than $18 – We will increase our ability to generate a million dollars in sales if we have a higher price point per unit. Greg has placed his floor at $18 during this research phase. Product Improvement – If we can sell a product that is better than the competition, then it improves our chances of generating more sales. We were able to do this with Jungle Stix, by selling a longer stick, and in greater quantity per package. Small and Lightweight – It reduces storage and shipping fees if a product is small and lightweight. At 36” in length, Jungle Stix did not meet this criteria, but there were other factors that offset this downside (mainly the significant demand with scant competition). Let’s take a look at some of the powerful initial product research methods covered in the webinar. This is a quick aside to show you how you can get a product’s estimated monthly sales. It’s very simple. These are the same algorithms that we use in the Web App and Extension, so you can rest assured that these are the most accurate and up-to-date sales estimates around ;-). For private label sellers, not all products are created equal. There are complex products, like Appliances, Camera & Photo, Cell Phones and Accessories which are better to avoid for various reasons. Mainly, complications with manufacturing and shipping make it a looming headache with quality assurance, customer reviews/returns, and liabilities. Additionally, anything that goes “on” or “in” your body – lotions, foods, nutritional supplements, are laden with potential liabilities. Categories such as clothing and shoes are ones to watch too. Most people have brand preferences when it comes to clothing, so creating your own brand is less likely to succeed here. There are infinite ways to find product ideas (like browsing through Amazon Best Sellers, eBay, Alibaba, Reddit, or even our own list of over 1000 high potential niches). But for simplicity’s sake, we are using the fastest proven method we know: Jungle Scout’s Web App. 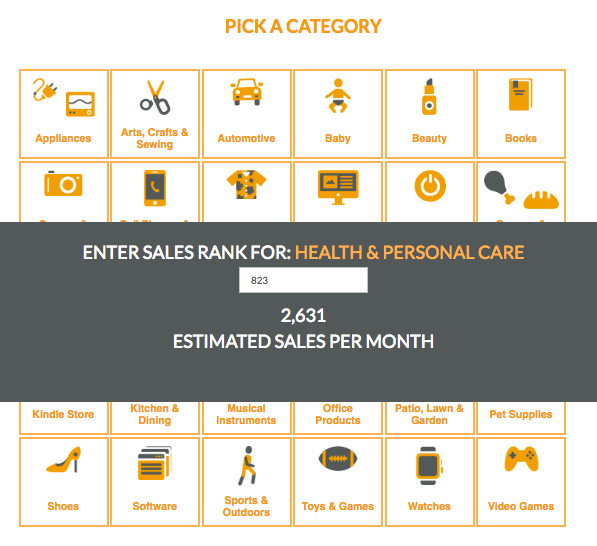 It is a catalogue of Amazon’s best selling products, organized by the data that we as Amazon sellers care about: monthly sales, price, Best Seller Rank, Rating, number of reviews, and much more. Price – greater than $20. Estimated Sales – greater than 400 per month. This ensures that the product sells well. Reviews – under 100, thus a relatively new product without a long history of customer reviews. This means that we could compete with the same product in a short amount of time. 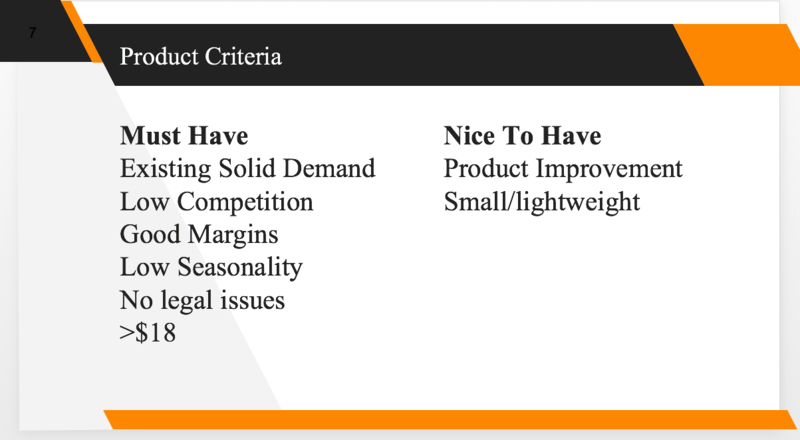 Rating – under 4.2 so that there’s room for improvement to create a differentiated product. We started with 20 million products in the initial Product Database, and after the criteria filter it got whittled down to 2100 products. From this curated list of products, we have products that sell at a rapid clip (more than 400 per a month), yet still belong to relatively new niches and are not too competitive. Avoiding clothing brands and licensed products. It met the basic criteria, around $20, 400 sales per month, and opportunity for improvement. But is it a good niche overall? 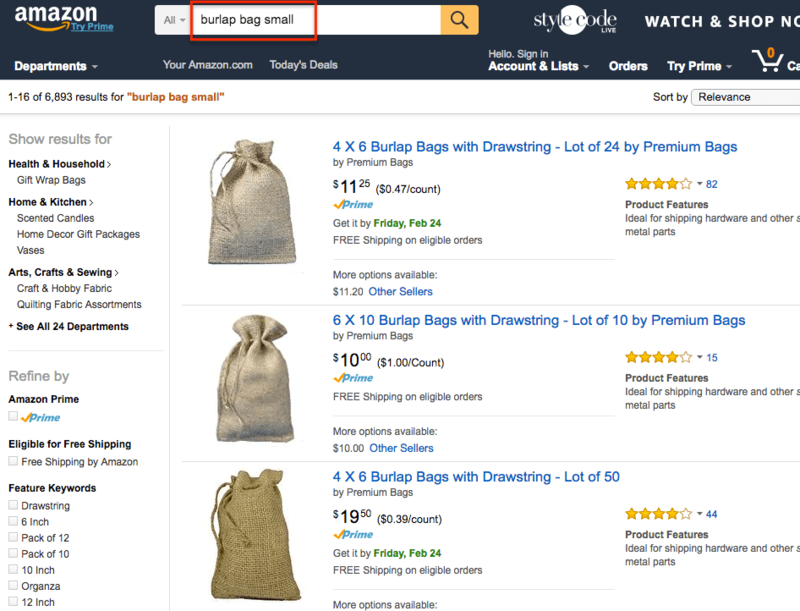 To answer this question, we pulled up the main keyword, “burlap bag small” in Amazon, and examined the data that Jungle Scout Extension showed on the niche. The Extension is an excellent tool to evaluate a keyword and niche as a whole. Unfortunately, the bags look to be priced too low, generally around $12. The top reviewed listing sells well at 320 estimated sales, which is decent. However, the top 10 sellers for this product are not all selling this well. There are about 1000 sales for the top 10 sellers, which indicates a lower demand. Greg likes to see 2000 sales, so twice as much demand. The positive part here, is that there is low competition if we look at the number of reviews that this product has. 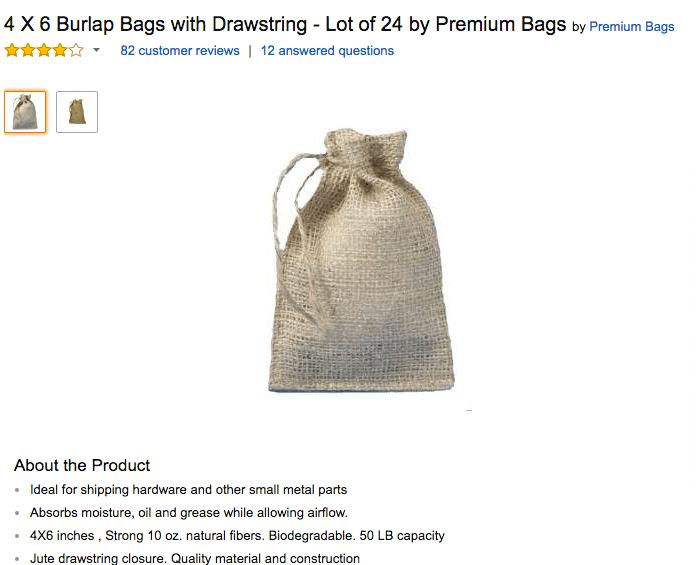 So we could probably rank in the top organic results for “burlap bag” relatively quickly. But the sales would be scant. Who really wants to be the ruler of a deserted island? Not us, at least for the purposes of this case study! 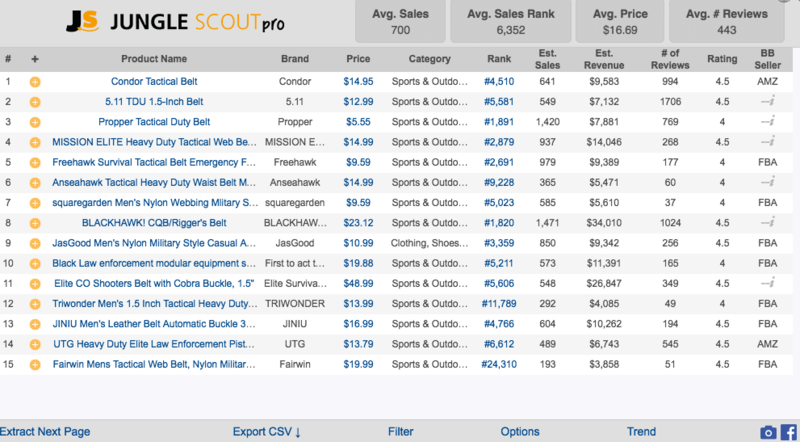 The demand for these belts is definitely there, with all of the top 10 sellers moving more than 400 units per month. However, it is also relatively competitive, as only one seller in the top 10 (the 7th ranked product) has less than 50 reviews. Awesome! Now the question is, can we make a profit on every sale if we sell this product? Let’s assume we sell a higher-priced product, maybe $24 like some of the other options. The Amazon FBA fees are around $7, and assume $7 for product costs and shipping, that would be $10 profit per unit. All hypothetical still, but promising! In short, the material has room for improvement, and quality of product overall was poor (threads coming out already and poor stitching). These could be improved with some special requests to the manufacturer. Now let’s take a look at the historical and seasonal trends of “baby hooded towels”. There is a slight uptick in searches since 2011, and the zig-zaggy pattern of the trends indicates some overall seasonality. However, it is not a feast-or-famine seasonality, which is what we want to avoid. The overall assessment is that it is a decent product. However, the search will continue! Before breaking for the week, Greg shared a few more strategies for uncovering good products. These are products that can be easily improved by reading bad reviews. Presumably, if we worked with a manufacturer to address the existing shortcomings, and used that to differentiate in marketing, it would be a great opportunity for us. Smart thinking! 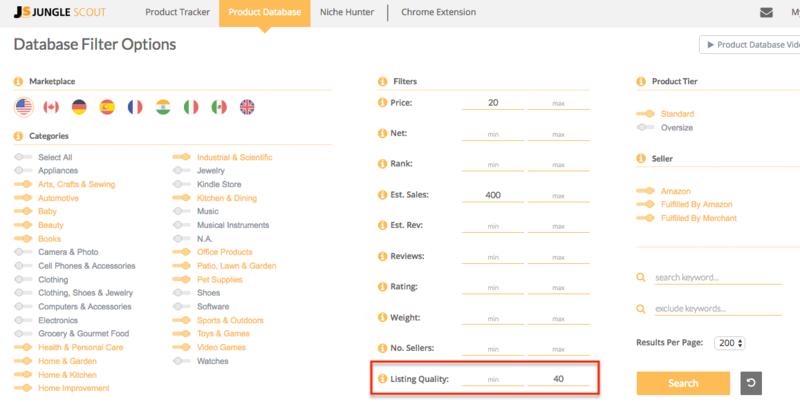 The Listing Quality Score is a proprietary Jungle Scout rating that analyzes the strength of a rating, including quantity and quality of product images, Product Title, Product Features, Product Description, and more. The difference is self-evident. Yet this product could be selling incredibly well, even though it is doing no favors for itself. If you could beef up the listing with more keywords, better pictures, and actually convince more people to click on the listing and purchase, that would be money in the bank! Funds to charity! A winner indeed. So that’s a good way to find additional product ideas. So that’s a wrap for this week. In the meantime, Greg is going to continue using the methods outlined above to find more product ideas, and re-evaluate where there may be opportunities. At this point, it is just about creating a lengthy list of potential ideas, and points of differentiation or improvement. Follow the next steps in session #2 which we held on Wednesday, March 1st. If you missed it or need to rewatch, you can catch the recap, replay and slides here. Let us know how you are getting on with your own product research journey in the comments below. Looking forward to working through this journey with you! – how do you choose your market place? – can you recommend other “criterias” (number of maximum reviews of sellers etc etc) for people in Europe and especially France. Hi Gen….Thanks for providing this invaluable content. Am new to Amazon FBA and following the ” Million Dollar Case Study” for my product research. However, I have narrowed my potential products to ten. Can you help me in picking one that is likely to do well. Since this is my first am lacking the confidence to pick, can you please help. Awesome and amazing info and it is free. Wow. Thank you so much. If everyone is using the same software with the same/similar criteria aren’t we all just going to end up selling the same products and kill the market for one another? In theory. And in the last few years, there was probably some shrinking of the market because of the promotion of the old 10 x 10 x 1 rule. The big thing I see a lot with new sellers is that usually pick products that are waaaay too cheap and end up never profiting. My strategy has long been go for low MOQ stuff with high profit margins. Slower sales, but ultimately higher ROIs. Very informative article. I am looking to getting started with Amazon fba but I feel overwhelmed by all the courses out there. I dont know where to start. I was trying to do it myself with your articles but I feel it is information all over the place. It would be a good idea if you guys create a course well structured involving your tools. It would be a great way to convert and you can price the course at a very cheap price with the goal to get people to buy into your apps. I’m a newbie looking for a product , niche to start selling on Amazon. 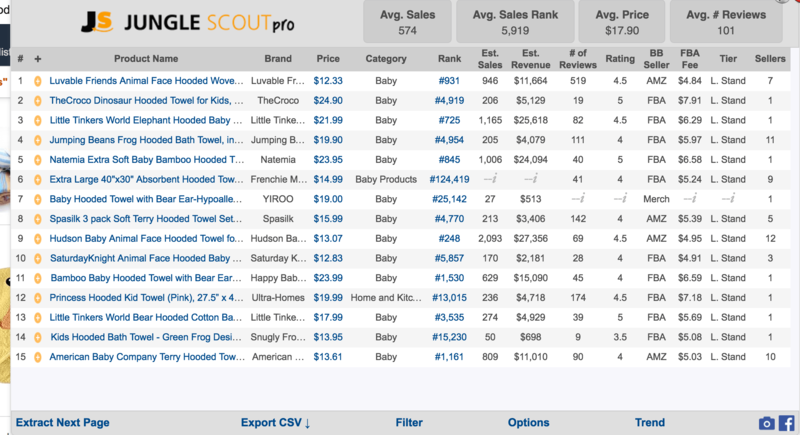 The Jungle scout web app is a great tool for research if you’re in the US , Amazon launched in Australia less than a year so there are limited informations on sellers ranking , products review , average monthly sells . Can Jungle Scout web app help or is there another way to do research into Amazon in Australia . I think we’re currently working on the Australian marketplace for our tool set. So stay posted. For the time being, you might be able to gauge product popularity with Amazon Australia’s best seller and movers and shakers lists. This is beyond epic. Thank you for sharing all your learnings team. Sounds like they’re trying to take advantage of you, unless you live in a very strange location. Try using Freightos or sourcing a third part shipper. Manufacturers WILL try to profit on shipping, especially if they made the product sound super cheap. I was lucky to learn about this site. I really want to learn how to trade on Amazon and therefore, just started to study the recommendations of Greg Mercer and his team. Thanks for your work! That means you need to have more than one listing showing when you pull up the extension. You can pull data from a product page, but the opp score only pulls up on search pages. Hi, my question is: I would like to sell two items in one package on Amazon, however those products come from 2 different manufacturers. Should I have them both sent to me and I package them myself, then send to Amazon? Or negotiate with one manufacturer to send the product to them, then they can bundle with the other product as one and send to Amazon? Thanks for any feedback you provide! Do what’s easiest for you. Personally, I send all my products to one manufacturer and have them do it for me. Additionally, I have all my products shipped to the same place in China to hop on the boat, too, so I don’t have to pay multiple shipping charges. Thank s a lot for sharing! Great, logical spte-by-step guide. Great work. Great way of learning. Greg mentions to look at the top 10 for sales and reviews. This top 10 is best upon what? The keyword used? It does not seem to be based on the ranking or sales results. If it is based on search results – why is that the most important top 10 to look at and not sales or ranking? 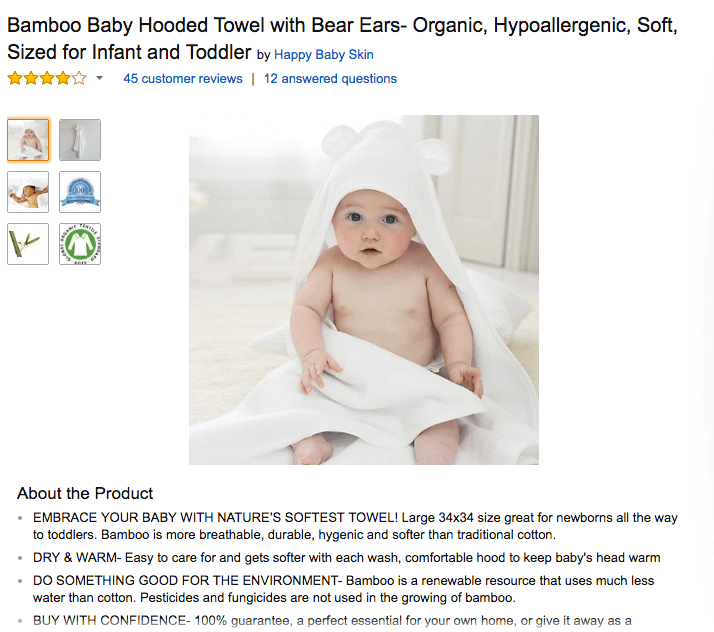 Yeah the easiest way to do this is to search for your top keyword for a product idea in Amazon, so let’s say “baby hooded towels” and then you want to be looking at the top 10 results that show up in the search results. 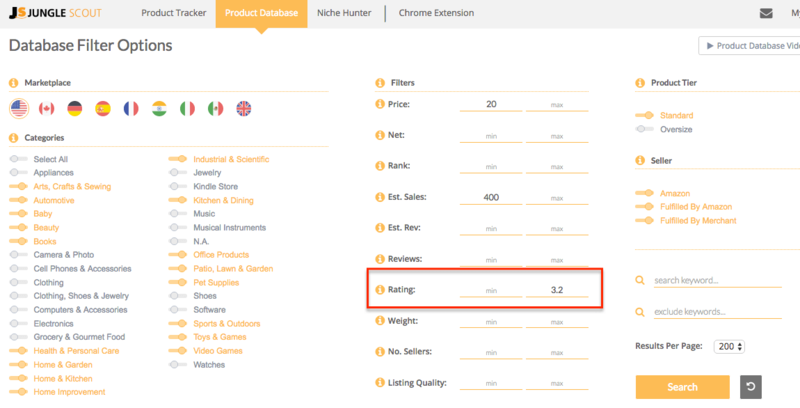 If you use the Jungle Scout Chrome Extension if you just go ahead and open it on this results page, the extension will show you that top 10 automatically, and all of the relevant sales estimates, reviews and data. Ranking is difficult because it fluctuates, and the way that Amazon calculate a product’s rank is heavily determined by sales velocity and sales history. So it’s not uncommon to see a product with the best rank for that category showing up in the 4th position for the search term. It’s just how Amazon works. So, as things can fluctuate, this is why we recommend tracking a product idea and the top 10 over a longer period of time. You can do this manually in the extension (and export your data), or by adding products to your product tracker inside the JS Web App which will automate this and give you sales history. Hey guys. Started looking into FBA PL about 2.5 years ago. Life got in the way and here I am now trying to kick start it back again. Thank you guys for this case study as well as EVERYTHING else ya’ll do. I hope these tactics and information is still relevant for 2018. Anyways, please feel free to ask any questions here on any of the comments and we’ll help as much as possible! Hey Dave- thanks for the response and heads up. I will definitely make note of it and try to come back around to the series… I hope you guys will be posting them somewhere on here just like the other series. I’m trying to hone down my self-teachings here and am focusing solely on this case study for now and what Greg does, just so I can get a feel for the basics. I feel like when I started this 2.5 – 3 years ago, I was all over Scott’s TAS podcast, some of Gregs, and others. I felt overwhelmed and had that information overload feeling. Hopefully with me purchasing JS Pro and the Web App as well as treating this case study as my new religion, I can succeed. Fingers crossed! Thanks a lot for making it clear. I am already following Million Dollar Case Study. Since the JS chrome extension new feature “Opportunity Score” is there now ,should we look and rely totally on this only or we still have to consider number of reviews too in order to conclude on product research? Opportunity score is something we calculate based on our own proprietary calculations. It is an indicator over the overall opportunity which considers demand and competition. It is just a guide and you should use it as such, and then conduct thorough in-depth product research for any products you are interested in selling. Thanks a lot for the feedback, really appreciate it. you may be able to display it using chrome extension and see it for more details, Actually I am confused whether to rely solely on Opportunity Score or still have to consider other metric such as reviews, sales too, if one has still look for the number of reviews & est sales, etc then what is the use of opportunity score then??? Will appreciate it if you could shed a light on clearing it. To answer your question, you should not rely solely on Opportunity Score. This is one metric you can use to guide you when you are browsing through lots of product ideas, but ultimately you need to look into all of the other metrics in more detail during your research. The Opportunity Score simply gives you an easy to understand overview of how much opportunity there is based on our data and algorithms. But of course, different products and niches have different considerations and this is something you should always investigate thoroughly during your own research. In particular, it’s important to ensure you do some research to find out that a product is going to be profitable, and easy to source and manufacture! I’d recommend heading to our Million Dollar Case Study for an in-depth walk through of finding and launching a product on Amazon. 39.99$ including the product database? Thank you for the video. It is very inspirational. I am working on it now. One quick question, how do I bring up the FBA profit calculator? I don’t see it in my Chrome extension. The fees/fee calculator are only on the JS Pro version, not the lite extension. If you have the pro, click the options link at the bottom of the window to turn on this feature. Thank you for this videos..they’re very helpful. Can you give me your opinion about the following product: it’s sold by only one seller, has a good rank, 5 reviews and is a little strange. I like it but how do i know if it’s ok? Should i wait more time to see how it goes? Thank you! It’s really difficult to say from that information but if you follow the criteria which are laid out in this post, then you should be able to gain a little more perspective on it. For example, is it easy to source and import? What price will you be able to sell it for and will this generate a profit margin? And, arguably most importantly, is there demand? How many estimated sales does this product get on Amazon each month? Once you have been through the criteria in the post, I advise moving on to Session #2 of this case study for more advanced product research! Great content , keep ahead ! would you or Greg share some emails or email outline? trying to learn what is the best way to respond customers’ bad review? seems this one of element to improve AMAZON organic ranking. There’s some really useful email templates in this post on the Jump Send blog. These templates are for automated emails that you send to all of your customers. 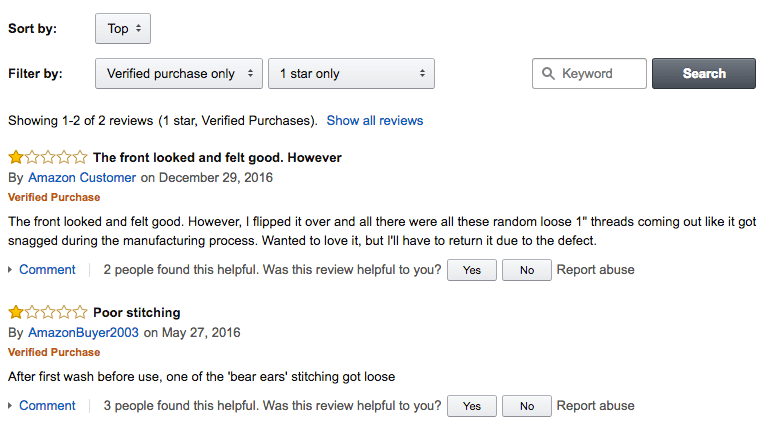 You are right that negative reviews may impact your product’s performance and ranking. We find that setting up automated emails like this helps to prevent negative reviews from being left in the first place. Unfortunately, the only way to email a customer after they leave a negative review is to manually find their email (if their name is displayed with the review, which sometimes it isn’t), and send them a personal email. Another option would be to give them a call as you should also be able to see their telephone number. Thank you for your review on our product, and we are sorry that you are not fully happy with the product. We are writing to check whether you have any issues with the product? If yes,we would love to offer assistance. we saw you give us 1 star , and we really sorry for your inconvenience, could you please tell us the detail about the problem of the mount, we would like to help you to solve the problem, we really want to provide best product and best service to our customer we offer a lifetime warranty with your purchase.could you please give us a second chance, and we would like send you replacement or partial refund.which one would you prefer？ your satisfaction is really important for us, hope for your understanding!looking for your reply! is this kind of email follow up, you guys will do the similar for jungle snug or you guys have better strategy? Thanks for sharing. We set up automated emails campaigns using Jump Send to email all customers who buy Jungle Snugs at certain points. One after they purchase, one after they receive the product and another a few weeks later. The purpose of these emails is threefold: to reinforce the benefit of the products, to make sure all customers know we are here and available to speak with them should they have any issues and to ask customers to give Jungle Snugs a review. Having these automated emails in place really helps to prevent negative reviews as it increases the likelihood of the customer speaking to you directly first. When you do receive a negative review, so long as their name shows under the review (and it doesn’t just say “Amazon customer”) then you can dig out their contact email and send them an email like in the examples you shared. This is more of a manual task but would be great for your customer service efforts. You also have the telephone numbers of customers, so you could also try calling in the case of a poor review. I see junge snugs climb up so quickly in front of my eye. what is the real key to climb up to top 10 on the list? i see you lowered your price to $17.95. are you doing both lowered price and coupon? which means you may sell less than $10.00 for each? You are correct, the Launch Strategy was to focus on increasing sales velocity by offering promotional coupons and following up by email to get product reviews. thank you for your blogs. 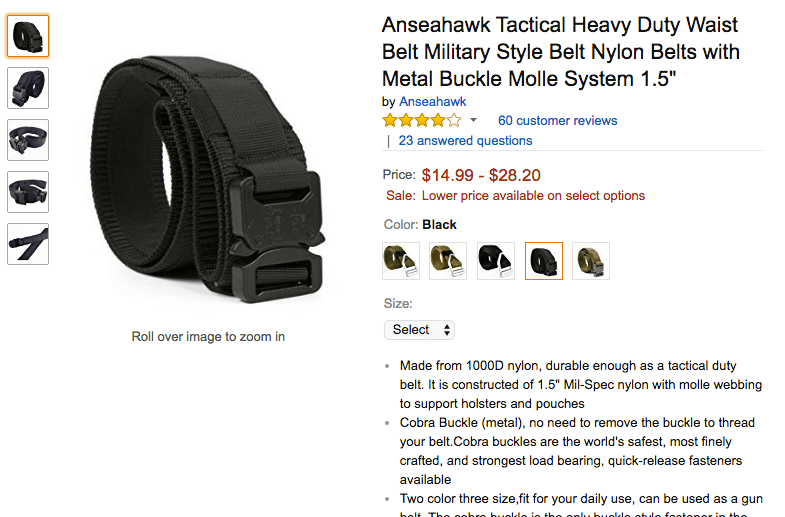 I am starting my Amazon business and doing research on selecting a product. 1) While doing research I came across some course offers on product research and some of them said that relying only on JS data for product selection is risky because it may function inaccurate. 2) How important is BSR ranges for selecting a product in each category? I would appreciate if you could answer my questions. 1. Jungle Scout sales estimates are just sales estimates. 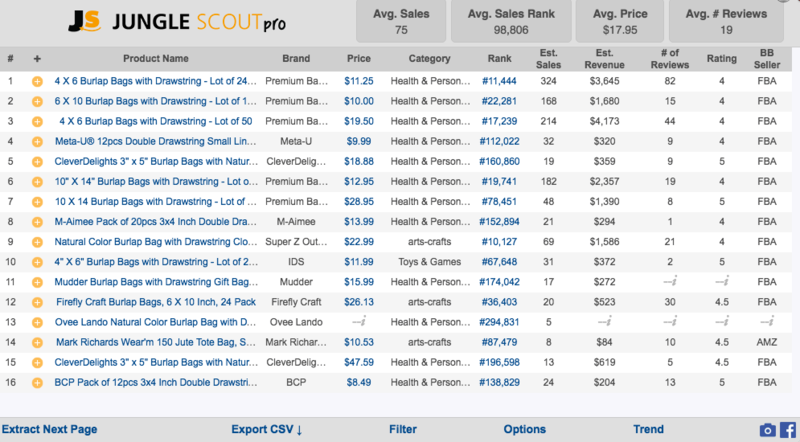 However, you can get ACTUAL sales data by adding any products of interest to the Web App’s Product Tracker. This is very important to your product research process. 2. The Best Seller Rank is less important than the actual sales that a product generates each month. Ultimately, the BSR is just a proxy for how many units are sold each month, for a given category. 1. on your extension, you have rank. is it the amazon ranking you are talking about? 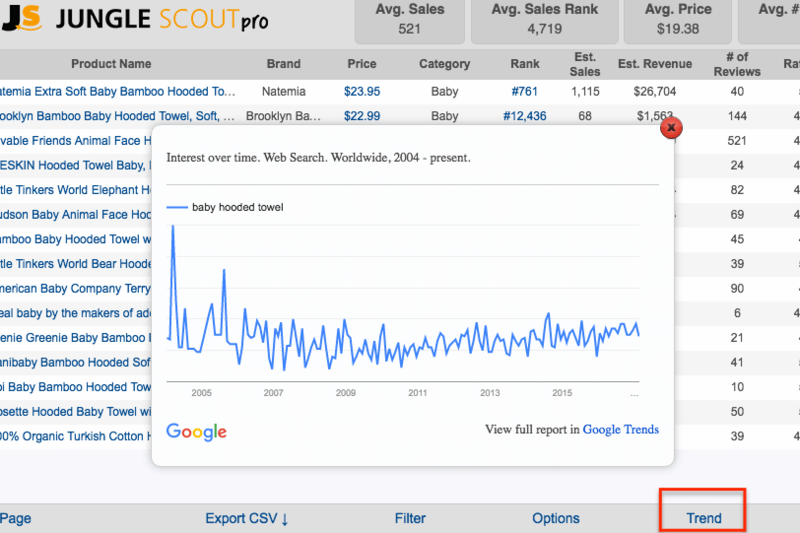 2. for example, when we search “hooded baby towel”, clearly, you can see the results are not sorted by rank on your extension tool. this is puzzle to me. How do you sort the results on your extension?? 1 Yes this is the Amazon Best Seller Rank. 2. The results in Jungle Scout, and Amazon, are not strictly based on Best Seller Rank. Sales velocity, sales history, reviews, etc are all considered in how Amazon ranks its products, so that explains the ordering that you see. when using extension and data comes out as default, why do you call the first 10 is top 10? I thought you sort data based on ranking, it seems you are not. can not understand how you selected the top 10 on your software? If you can help to understand it, it may help us make effort to make our own products to top 10 list. The results are organized based on Amazon’s ranking of the products. This is the best indication of the product/niche at a given moment, as it is a direct representation of Amazon’s ranking. hope this helps! We are going to cover finances and accounting in a few weeks with Shane from Fetcher.com, but you are addressing a common challenge with physical products, is that it is rather capital intensive. There are financing options that have been popping up, but probably the most prudent is to plow back profits into the business so you are avoiding debt. Hope this helps! I just found your case study and I’m blown away with this information. THANK YOU for sharing your knowledge and I’m extremely excited about starting an Amazon Business!! Glad you found us, and great to hear that you are starting an Amazon business! Let us know if we can help, in the comments or email us! Thanks for the reply Kym. It’s not a JS issue, it’s Amazon. There are 1,786 listings. Looking through the first 100 and hardly any of them are properly categorized. Maybe Amazon employees need to use the web app and see all of the incorrectly categorized listings. When using the app and extension I see many products that are incorrectly listed in the beauty category on Amazon. It appears this is wildly throwing off the sales estimates and making products appear to be selling much better than they are. Have you noticed this? Any reason why so many products are incorrectly in this category? 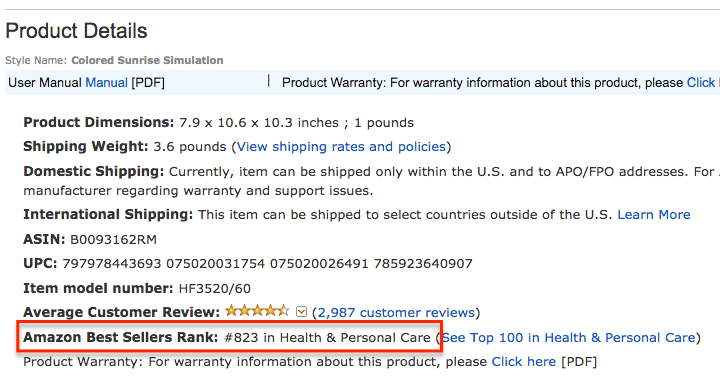 Amazon does sometimes categorize products incorrectly, which is not something that we can control (they occasionally give the wrong BSR as well). If Amazon has incorrectly categorized, then the sales estimates won’t be accurate. If you are using the Product Tracker in the Web App, then you could always pop it in there, to see if we can get inventory data to get real sales numbers. Real fascinating ! So got this question – my wife and I are self employed and we buy a lot of stuff from Amazon that are repeat items for the business (so obviously they are needed are required). This way we benefit ourselves with a lower buying point + make some extra cash as well . If so we should get the JS Web App, correct ? Welcome to the case study, glad you are enjoying it! Yes, if you are buying in bulk you could certainly buy some for yourself and resell some on Amazon. And yes, you would probably want to verify with some sales data (using Jungle Scout’s Extension, Web App, or the Free Estimator — junglescout.com/estimator) that there is significant demand and an opportunity for you. Hope that helps! Just wanted to alert you that there may be issues with creating a private label product using bamboo fabrics. Apparently bamboo fabric is made from the bamboo plant and processed into rayon using toxic chemicals. The FTC has fined numerous companies and retailers (including Amazon) for falsely making bamboo fabric claims. See the following for links to cases and more information. Thanks for the heads up on this, very interesting point we will look into this for sure! 1. How do you manage to pull the entire Amazon database?! 1) It’s not the entire catalog, however, it is ~99% of the products that sell 1/month or more. We don’t care about products that only sell like 1 each year so they’re left out. We get the info through an API. 3) For the product database, the data just shows the snapshot in time when the product was updated. hi gen u and greg are the best! u actually purchased the js pro web extension and it works very good! did anything changed that he changes his criteria? Thanks Dave! Glad you’re enjoying the tools 🙂 Both of these are just rules of thumb, 2000 or 3000 in the top 10 sellers are both good amounts of demand. If you wanted to find a product with even higher demand feel free to use 4000 or 5000. A huge thank you to Greg, Gen & the team for launching this mega follow-up to JungleStix. Everything you do is so professional! Your private label blueprints & Jungle Scout software are immensely valuable, especially to someone like me, still trying to find a first product to sell on Amazon UK. 1. Right at the very end, Gen added some important ideas on product research, including analysing “other products” sold by competitors. It was 2am here and I ran out of steam taking notes and missed several great suggestions. These are not covered in the session 1 recap. Would it please be possible to add them? 2. Some of the filter numbers you use for the US – sales of 400 units/mth, for example – simply aren’t appropriate for the small UK market. Is there any way you could solicit input from your UK followers and come up with a UK filter list? 3. Gen said about 10,000 people had joined the webinar. 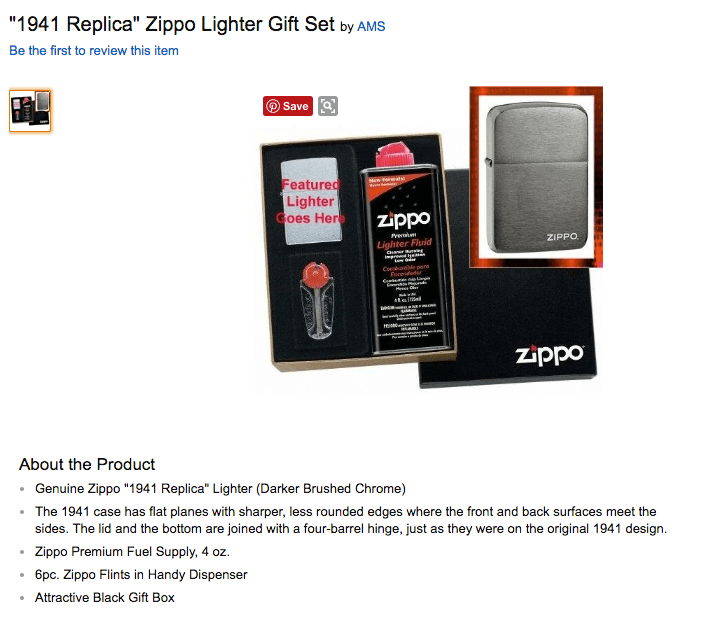 Greg’s first curated product list contained 2100 items. If only 10% of 10,000 take action, that’s 1000 people scrutinising 2100 ideas, which may contain only 10 really viable products. Isn’t this saturation on steroids? Thanks again for great educational material!!! Thanks for the kind words, and thanks for staying awake until 2a to watch! 1. What I suggested was “spying on competitors”. This basically entails looking at the storefronts of what other prviate label sellers are selling. If you then pull up Jungle Scout dataa, you can see which products they are having sucess with, and see if there are any ideas that you would want to investigate further. In order to find the private label sellers with the Web App, you can filter the “Number of Sellers” filter to be a minimum of 1 and maximum of 1, so youcan be sure that there is only one seller of the product, hence a private label. 2. Good point, the filters for UK may be different than the US. The 400 is just an indication to Greg that there is indeed demand. Maybe try 200 in the UK, see if that is a good threshold to separate some ideas without being overwhelming. 3. 2100 ideas certainly is a lot, and there are far more ideas. About literally millions, in the Product Database alone. Amazon is a huge marketplace, and the key takeaway from the case study is the value of really niching down to a small subset of Amazon’s customer base looking for a particular long tail keyword–that you sell! Good luck in your research Peter! I just spread the million dollar case study sign up link to a couple of hundred people in my group. Thanks very much for the kind words and sharing the case study. If you have any specific questions, please drop them in so that we can make sure to address them.